Where the heck is Lando? Bad news, Star Wars fans. Director Rian Johnson has confirmed that Billy Dee Williams' Lando Calrissian will not appear in Star Wars: The Last Jedi. The actor said as much during this year's Star Wars Celebration in April, but this puts the final nail in the coffin. Though, Johnson's reasoning is hard to argue against. Here's what he had to say about it in a recent interview. "No, and I don't want fans to get their hopes up. He's not in the film and it was never really something that came up. I mean, I loved that character. It would have been fun to see him, but it's just not something that ever really had a place in the story." At least Rian Johnson isn't being cagey about it. Even though Billy Dee Williams said he wasn't in the movie, that was back in April. There was always the chance a scene could have been added to include Lando Calrissian in Star Wars 8 between then and now. But that's not going to be the case. So if we're going to see Lando at all in this new trilogy, it's up to J.J. Abrams to find a place for him in Star Wars: Episode IX. 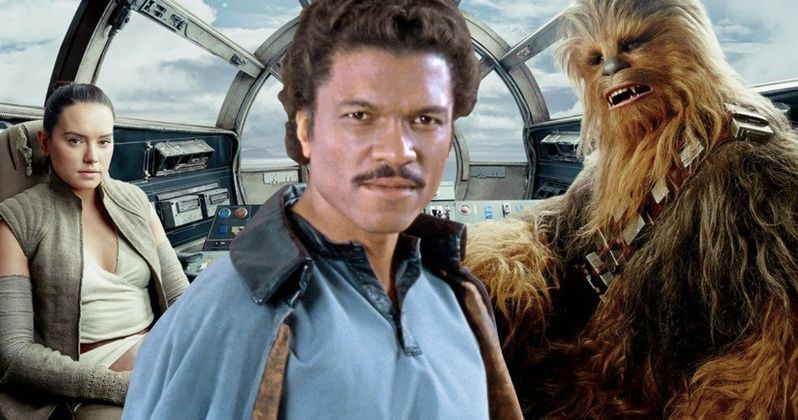 While many fans are eager to see Billy Dee Williams appear as Lando Calrissian one more time on the big screen, Rian Johnson says it isn't happening in The Last Jedi for the best of reasons. One could imagine a scenario where Lucasfilm says, "Wouldn't it be great if we had Lando show up in this movie?" But Johnson was committed to telling the story he needed to tell and that doesn't involve Lando Calrissian. He didn't attempt to force in any fanservice. That's a good thing. Billy Dee Williams has always embraced the role of Lando Calrissian. While some actors, most notably Harrison Ford, did their best to distance themselves from Star Wars for many years, Williams always was a great ambassador for the franchise and has reprised the role when given the chance. He's even appeared on a few episodes of Star Wars Rebels. Though, it would be a shame if those episodes were the last bits of Lando we ever get. The other potentially good thing about this is avoiding parallels. Rian Johnson has promised that Star Wars: The Last Jedi, which arrives in theaters on December 15, isn't just going to be a rehash of The Empire Strikes Back. Not having Lando in the second installment of the trilogy removes at least one similarity. While Johnson confirmed Lando won't appear in The Last Jedi to Entertainment Weekly, we know he's willing to come back, which is good. If nothing else, we'll get to see Donald Glover as a young Lando Calrissian in Solo: A Star Wars Story next year.